TULSA, Okla. – Making its return after four seasons on the shelf, the American Bank of Oklahoma ASCS Sooner Region presented by Smiley’s Racing Products will take on 20 nights of racing in 2019. Combining the Sooner and Lone Star Regions in 2015 to form the ASCS Red River Region, the two tours will both return in 2019 to replace the Red River Region. The reason for the two separate regions returning falls back on the cost of travel, as several North Texas ovals have come back on board. For the American Bank of Oklahoma ASCS Sooner Region presented by Smiley’s Racing Products, the series will see action at 11 facilities across Arkansas, Kansas, Missouri, and Oklahoma. Creek County Speedway in Sapulpa, Okla., takes the largest share of shows with seven. Of those, a trio will be co-sanctioned with the Lucas Oil American Sprint Car Series presented by Sawblade.com. Other Oklahoma ovals include Lawton Speedway, Red Dirt Raceway in Meeker, and Tri-State Speedway in Pocola. 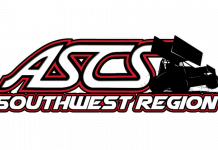 Three nights in Arkansas lands the series at I-30 Speedway in Little Rock, with each night joining with the ASCS Mid-South Region. Rolling into Kansas on six occasions, Heartland Park in Topeka will see a pair of nights with 81-Speedway combining NCRA with ASCS for a single night. 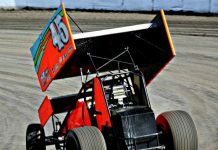 Paring again with the Lucas Oil American Sprint Car Series presented by Sawblade.com, the two tours will join up at Salina Speedway to wrap up the 2019 Sizzlin’ Summer Speedweek. The series will also visit Caney Valley Speedway and Humboldt Speedway. The lone trip into the state of Missouri for the Impact Signs, Awnings, and Wraps Open Wheel Showdown at Lucas Oil Speedway, the showdown reconvenes between the ASCS Sooner and ASCS Warrior Regions. The American Bank of Oklahoma ASCS Sooner Region presented by Smiley’s Racing Products pays $2,000 to win and $300 to start at all events, with $150 going to all non-qualifiers who attempt to race. March 29-30 – I-30 Speedway – Little Rock, Ark. April 12 – Creek County Speedway – Sapulpa, Okla.
April 13 – Caney Valley Speedway – Caney, Kan.
April 19 – Humboldt Speedway – Humboldt, Kan.
April 20 – Tri-State Speedway – Pocola, Okla.
May 3 – Red Dirt Raceway – Meeker, Okla.
May 4 – Lucas Oil Speedway – Wheatland, Mo. May 10 – Creek County Speedway – Sapulpa, Okla.
June 8 – Salina Speedway – Salina, Kan.
June 22 – Heartland Park Topeka – Topeka, Kan.
July 12 – Creek County Speedway – Sapulpa, Okla.
Aug. 17 – Lawton Speedway – Lawton, Okla.
Aug. 23 – Creek County Speedway – Sapulpa, Okla.
Aug. 24 – Heartland Park Topeka – Topeka, Kan.
Sept. 14 – I-30 Speedway – Little Rock, Ark. Oct. 11-12 – Creek County Speedway – Sapulpa, Okla.